(BOSTON) — A team of scientists at the Wyss Institute for Biologically Inspired Engineering at Harvard University and the Harvard John A. Paulson School of Engineering and Applied Sciences has evolved their microscale 3D printing technology to the fourth dimension, time. Inspired by natural structures like plants, which respond and change their form over time according to environmental stimuli, the team has unveiled 4D-printed hydrogel composite structures that change shape upon immersion in water. Lewis is a Core Faculty member at the Wyss Institute for Biologically Inspired Engineering at Harvard University and the Hansj_rg Wyss Professor of Biologically Inspired Engineering at the Harvard John A. Paulson School of Engineering and Applied Science (SEAS). L. Mahadevan, Ph.D., a Wyss Core Faculty member as well as the Lola England de Valpine Professor of Applied Mathematics, Professor of Organismic and Evolutionary Biology, and Professor of Physics at Harvard University and Harvard SEAS, is a co-author on the study. Their team also includes co-author, Ralph Nuzzo, Ph.D., the G.L. Clark Professor of Chemistry at the University of Illinois at Urbana-Champaign. 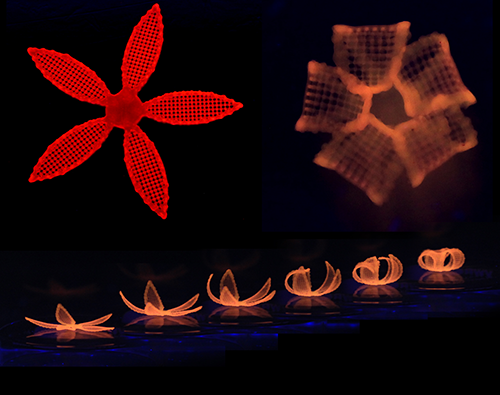 “What’s remarkable about this 4D printing advance made by Jennifer and her team is that it enables the design of almost any arbitrary, transformable shape from a wide range of available materials with different properties and potential applications, truly establishing a new platform for printing self-assembling, dynamic microscale structures that could be applied to a broad range of industrial and medical applications,” said Wyss Institute Founding Director Donald Ingber, M.D., Ph.D., who is also the Judah Folkman Professor of Vascular Biology at Harvard Medical School and the Vascular Biology Program at Boston Children’s Hospital and Professor of Bioengineering at Harvard SEAS. This work was supported by funding from the Army Research Office (ARO) and the National Science Foundation’s Materials Research Science and Engineering Center (MRSEC).